BLUF*: Chop a bunch of stuff together and put it on a pizza. Bake it. Enjoy. This pizza starts with chopped late summer vegetables, fresh mozzarella, optional meat, and a quirky sauce. Sounds fairly traditional, yes? I guess maybe the corn might be unusual unless you're outside of the US. I ate corn on pizza in Germany, but this particular combination was inspired by my fellow Learn Food Photography classmate, Gaurav Prabhu, during our 30 Days to Better Food Photography challenge. He shared this photo about making pizza it caught my attention not only because he did a great job of capturing the elements that went into his pizza, but also because of those elements. Chopped onion, chopped tomato, chopped pepper, and corn? Sounds like a good combo. A sauce of Szechuan chutney and mayonnaise? Interesting. Mild cheese to tie the whole thing together? Good plan. I decided to make a pizza using ingredients that I had on hand (corn I'd put up in the summer, red pepper, red onion, leftover Italian sausage and pepperoni). Instead of a chutney/mayo sauce I scanned the refrigerator door and picked up the bottle of Raspberry Enlightenment. It's suggested in both sweet and savory recipes, so I used it as a sauce. It was quirky--pretty good, yet not incredible like garlic scape pesto. I think this pizza would also be delicious with Gaurav's chutney/mayo or even a plain tomato sauce. I've been putting off this post, in part because I had more seasonal pizzas to share and in part because I really don't care for the photos of this pizza. The more I figure out how to produce semi-decent photos, or at least not blurry ones, it makes it really cringe-inducingly frustrating to see an older pre-rudimentary skills photo. Yet the other day I got the most delicious corn in the farm share, and beautiful peppers, and I've still got red storage onions, so it's a good time to suggest this combination. I just hope yours looks prettier than mine. Sauce options: Raspberry Enlightenment, Szechuan chutney + mayo, prepared pesto, thick tomato sauce, hoisin sauce, chow chow, what else? Vegetable options: chopped red onion (or sweet, or yellow, or shallots), chopped peppers of any color or heat level you can tolerate, chopped spinach, chopped tomato, chopped summer squash or zucchini, chopped roasted turnip or potato or carrot or winter squash, corn, what else? Protein options: cooked beans, seasoned cubed tofu, chopped pepperoni, crumbled Italian sausage, cured meats, cooked chicken or beef or pork, what else? Preheat oven to 450 degrees Fahrenheit. If you have a pizza stone, preheat it as well. If you've got a cookie sheet, no need to preheat it. On an oiled sheet of parchment paper stretch out the dough into the shape that pleases you today. Spread the sauce of your choice across near to the edges. Top with the vegetables you choose, cheese, and any optional proteins. Bake for 5-8 minutes, then shimmy the crust off of the parchment paper and continue to bake another 3-5 minutes until cheese is browned and bubbly. Cool on a rack a few minutes, then slice and serve. While you're looking at the only photo from the session that I did sort of like, I'll ask you this: based on what's in your kitchen right now, what sort of sauce and toppings would you choose for this pizza? Please let me know in the comments below. Holey pizza. Stuff falls through. *BLUF=Bottom Line Up Front, just in case you searched the acronym and came up with something unsavory. Ironically enough, I have hardly cooked a thing all week unless potatoes and eggs count, and I was just plotting out a veggie pizza for dinner tonight using the new pizza stone and some leftover veggies from the weekend, plus a few new ones picked up in last night's farm share. I'm thinking green beans (bastards), bell peppers, hot peppers, onions, garlic, maybe some corn all sautéed and the base for my pizza. Much like you, I plan to top the whole thing with fresh mozzarella. It sounds like a pretty decent jump back into cooking. That sounds pretty tasty to me--and the new stone looked very inviting in a 'I wanna go make a pizza NOW' sort of way. When's the post coming out about it? I think I have a jar of that Raspberry Enlightment somewhere on my pantry shelves. Time to go digging -- I'd never have thought to use it on a pizza. Did you get a jar when they were giving them away with a purchase? I did, and then . . . well, what *do* you use it for? I figured I may as well give it a shot. It was a quirky sauce for a pizza--different, good, I'd eat it again, this time with maybe some heat mixed in. Hmmm, now the wheels are churning again. 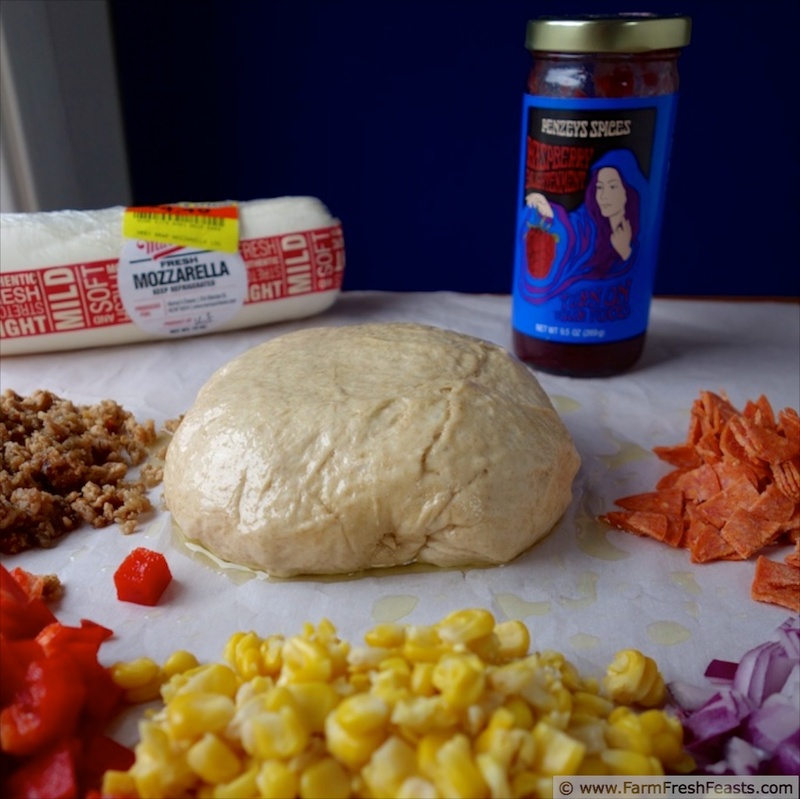 Now this is a case of "pull everything out of the pantry and fridge, and put it on a pizza" that really works. This looks and sounds fantastic! A true kitchen sink (or perhaps fridge & freezer & pantry) recipe. 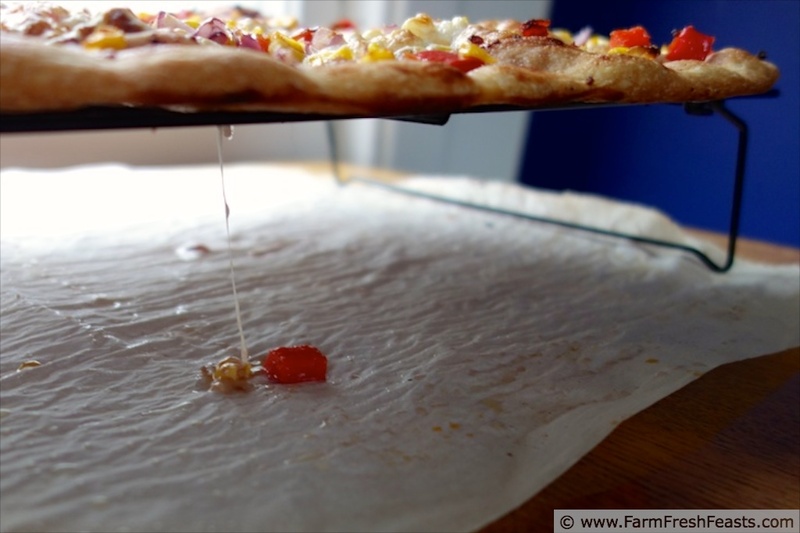 Ooh, I like the idea of using corn - I've never heard of corn on a pizza but it sounds great. And you remind me that I haven't made homemade pizza since my baby was born, which was over 3 months ago. Must change that ASAP! You must indeed change that--the beauty of pizza is that you can make the dough during naptime one day, and scrounge whatever leftovers you'd got to top it with another day. I absolutely love pizza and this combination is quite intriguing. :) I have never seen that brand of sauce, but I am sure it was wonderful. The pizza looks delicious Kirsten!! The sauce is from Penzey's, a mostly mail order spice company headquartered in Wisconsin (though I manage to find my way into stores a few times a year, generally related to a hockey game happening in the same town as the store). They have coupons and specials and I got the sauce free with a purchase. Really, though, any sauce that you feel like (tomato, BBQ, or even jam) would be neat to try. Pantry/leftover pizza. Guess I would have to go with pesto, lemon, red bell pepper, mozzarella, parmesan and hot chilis. Think I'd roast the red peppers first, if I were making it right now. And not totally sure I'd be a fan of that combo. I could also do olive oil, garlic, acorn squash, mozzarella and parmesan. Not sure I'd love that combo either. Hmmm, think I need to keep thinking. Or go to the store! Acorn squash appeals to me right now--that sounds great. You're reminding me that I actually did a Rainbow Pizza . . . can't re-use that name I suppose.